In the afternoon on Friday, February 1, Spanish pro-lifers from the Diocese of Cadiz carried the Częstochowa Icon onto a ship to cross the Gibraltar Strait and reach Spanish Ceuta. The journey lasted one hour. So the Mother of God in Her pilgrimage “From Ocean to Ocean” once again changed continents. In June 2012 She crossed the Ural Mountains, dividing Asia and Europe, and now the Gibraltar Strait dividing Europe and Africa. Ceuta is a Spanish enclave situated on the territory of Marocco, only 23 kms from the Iberian Penninsula. It has the Shrine of la Virgen de Africa (the Virgin of Africa)- the patroness and permanent Mayoress of the town. At the port a crowd with flags and lights was waiting for the Mother of God to lead Her along the main streets of the town to the shrine of the Virgin of Africa in a solemn procession. Crowds of people passed the streets and filled the shrine. The Holy Rosary in the intention of the defence of life and family was said. Next the solemn Holy Mass was celebrated. 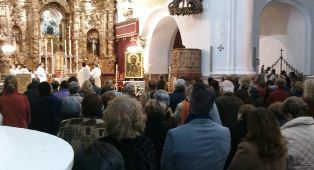 The prayer vigil lasted the whole night and was attended by many people, as the visit in Ceuta was very short and the Częstochowa Icon was due to leave for Europe on Saturday morning. The statue of the Virgin of Africa is closely connected with the history of Ceuta. It is a Gothic statue from the 14th century. It was presented to the city by Portugese prince Enrique el Navegante, the son of Portugese king Joao, who captured the town of Almohades at the end of the 14th century. The Virgin of Africa has always been connected with Ceuta and its inhabitants. Members of four religious denominations live here together: Christians, Muslims, Jews and Hindus – all of them feel connected with Her. For example, when the Hindus walk across the town in the procession of Ghanesa they always leave flowers at the main entrance of the shrine of the Virgin of Africa. Our Lady of Częstochowa was venerated all night in the shrine and in the morning She got into the Life Mobile, which was parked at the military barracks for the night. She boarded the ferry and returned to Europe after Her short visit to Africa. A little time was left so driver Fernando suggested a surprise stop and visit at the shrine of the Mother of God of the Saints in Alcala de los Gazules, which lies on the way to Jerez. The visit first surprised everybody but after the people heard the explanation of the idea of the peregrination “From Ocean to Ocean” they were overjoyed. They were really moved and grateful that the visit was possible. It lasted till 2 PM. The Mother of God seemed to want to stop at the place very much, as it turned out that this was the birthplace of a lady minister who fought ardently for the legalisation of abortion in Spain.